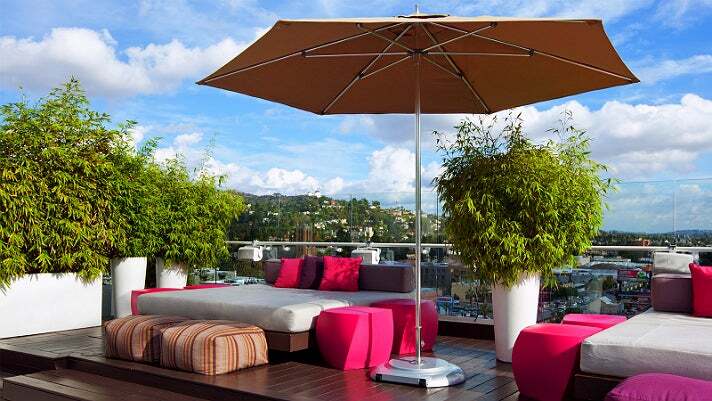 The grande dame of New Hollywood, the W Hollywood hit the scene in 2010, ushering in the new era with drama and style. 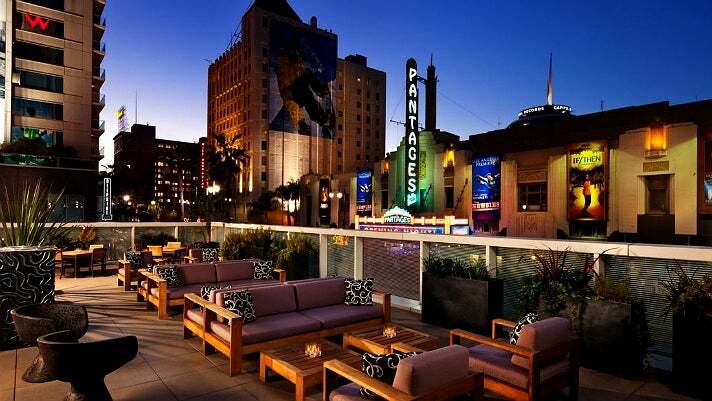 Hollywood’s neon skyline is undergoing a glamorous renaissance—now, you’re in the beating heart of it, from the most exciting nightlife of Tinseltown at your doorstep, to the gorgeous nature and hiking just minutes away. Channel your inner diva as you sashay along the hotel's spiral Grand Staircase, illuminated by a chandelier dripping from the ceiling. The W boasts everything you need to maintain your devilish good looks — get toned at the FIT Gym, or the Sunday yoga classes on the rooftop. Bliss Spa will take care of your skin and nails, and the stylists at Blo Dry Bar will make your ‘do their top priority. You’ll notice that the views are quite spectacular from WET, the hotel's rooftop pool and bar. Angelenos are obsessed with breakfast - Delphine, the W’s indoor-outdoor eatery, serves up a mean egg benny and brioche french toast. And there are plenty more great options a short walk or drive away. 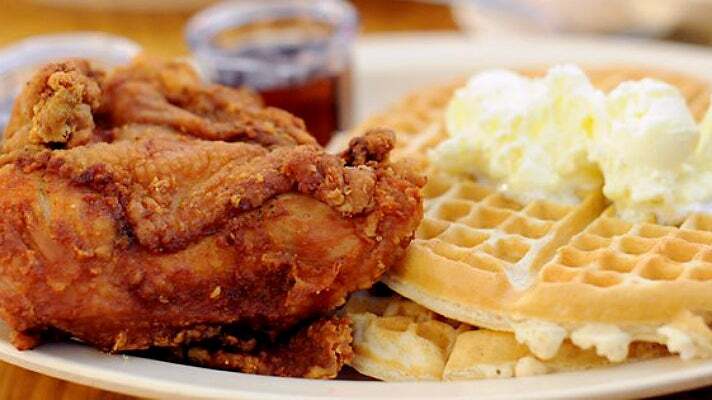 Roscoe’s House of Chicken and Waffles and Rodney Bingenheimer’s favorite Denny’s are located to the east, while the always-packed Griddle Cafe and Republique are to the west. Stop by the wonderful Hollywood Farmer’s Market (every Sunday until 1pm) for breakfast burritos, fresh oranges and flowers. A mile to the north lies the charming Franklin Village, a magnet for the young, beautiful and hopeful. There, the Scientology Celebrity Center (home of the mysterious chosen creed of Tom Cruise) serves up a crazy good brunch on Sundays, and the sweet Beachwood Cafe sits under one of the best views of the Hollywood Sign. Don’t forget to visit the excellent Counterpoint Books and Records, and pick up tickets at the Upright Citizens Brigade comedy house, a training ground for Hollywood’s rising stars. Though you’re in the heart of the city, don’t be surprised to see a coyote or two jogging down the street during your visit —the wilderness is just minutes away. 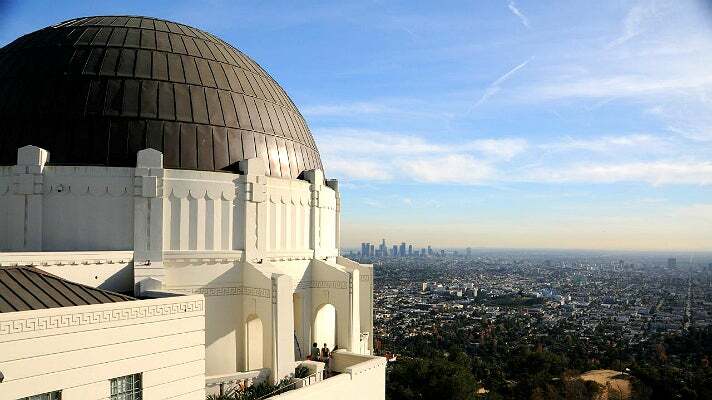 A great way to spend a morning is with coffee at the outdoor gem Trails Cafe, at the foot of a hike leading up to the Griffith Park Observatory with its iconic views and planetarium show. 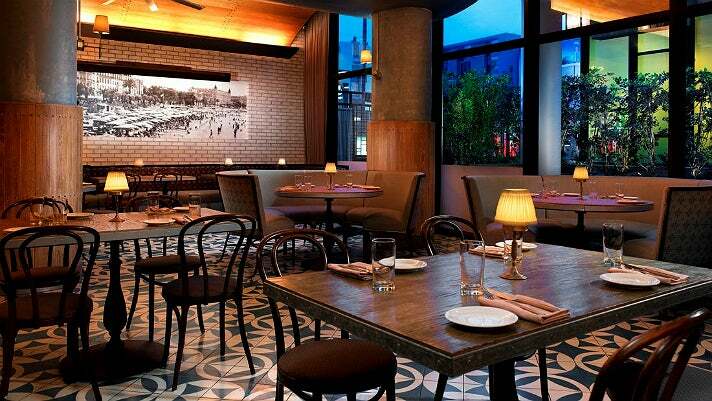 Make like a true Angeleno and grab lunch at Little Dom’s afterwards. 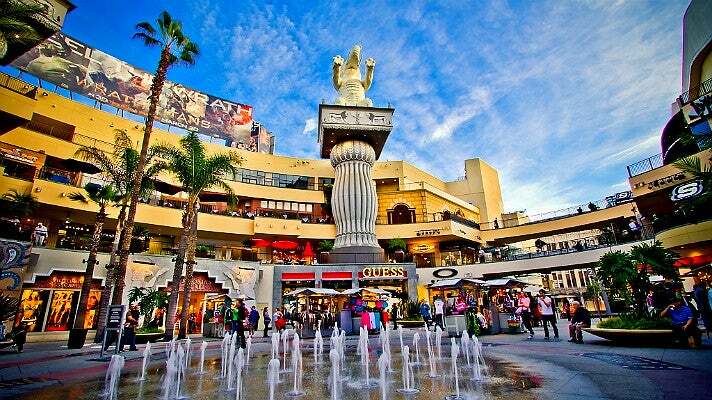 Follow the stars along the Hollywood Walk of Fame and they’ll lead you a mile west of the W to all the shopping you need — Forever 21, Guess, Louis Vuitton and more orbit the home of the Oscars, the Dolby Theatre at Hollywood & Highland. 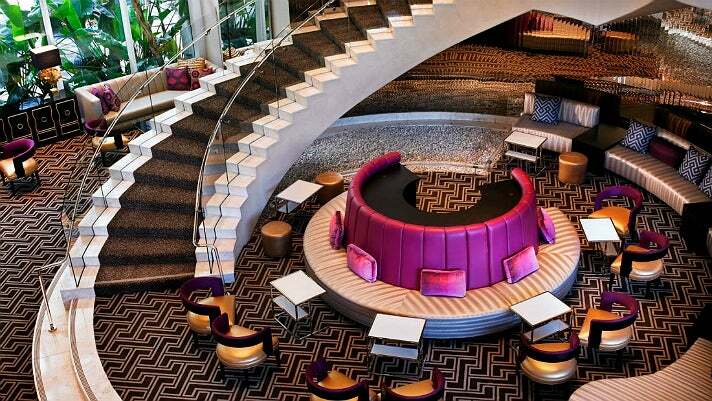 You don't even have to leave the W to get in the groove. From DJs on the WET Deck to live music in The Living Room and The Loft, the W's event calendar is jam-packed. If you’re in the mood for a show, the Pantages Theatre is across the street from the W - enjoy an evening show or grab tickets to a matinee. Cinephiles will love the ArcLight Cinemas, where you can bring your wine and beer into the showing. And music lovers should make a beeline for the legendary Amoeba Music, a sprawling record store on Cahuenga and Sunset. You’re undoubtedly hungry by now. For dinner, we love The Hungry Cat for seafood, and Katsuya has one of the best sushi scenes in L.A.
For cocktails, dinner or an art opening in Downtown L.A., the Hollywood / Vine Metro Station is right under the building. 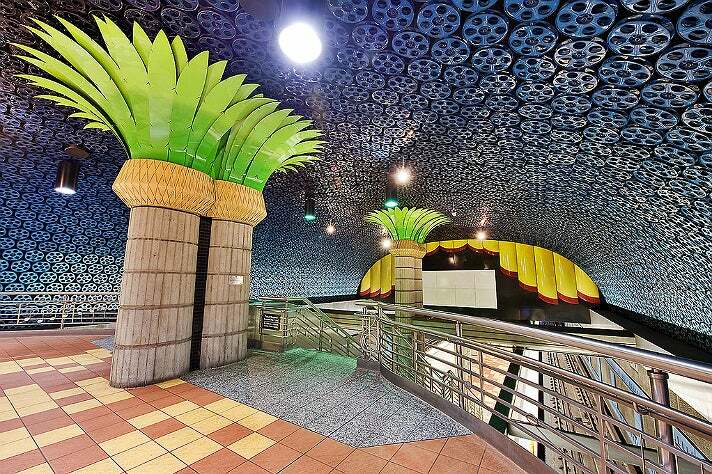 Go Metro and avoid the hassles of driving and parking. 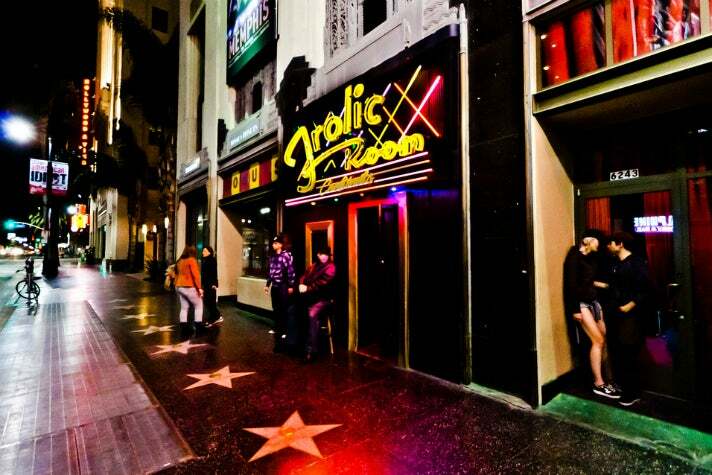 Close out the night at one of Hollywood’s plethora of dimly-lit bars — Lost Property, No Vacancy, The Well, and the Burgundy Room are great options for incognito drinks. There's also Loaded, if you happen to like your metal heavy. The always packed Good Times at Davey Wayne’s features a house band voted “Best Cover Band” by the LA Weekly.